The week we have all been waiting for all year. When most of our Christmas shopping dreams come true, Black Friday and Cyber Monday are here! If you’re getting someone, or even better yourself an electric scooter this Christmas. Then you don’t want to miss out on this year’s hottest electric scooter steals. But how do you find the best price drops during the crazy shopping festival that is Black Friday and Cyber Monday? -Well, at Envyride of course. 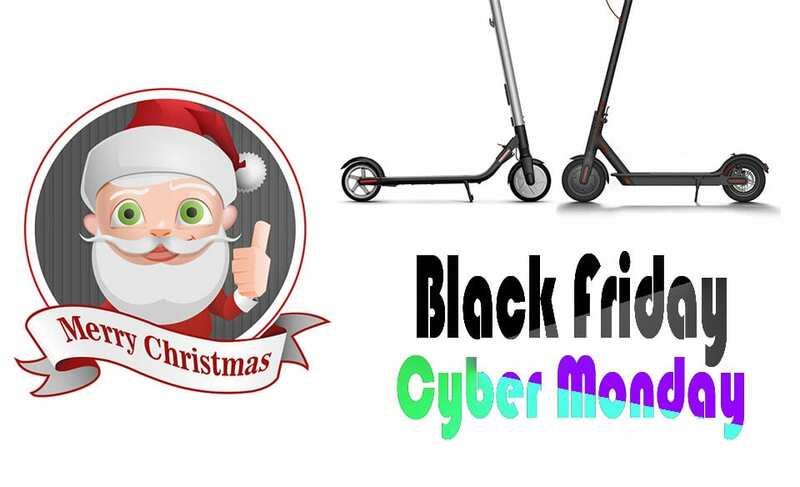 We’ve scanned the internet and curated a list of the best Black Friday and Cyber Monday electric scooter deals. Just so you don’t miss out on a bargain. I might be taking home one or two deals myself this weekend. We will be here 24-hrs a day and update the list throughout these wonderful days of pure Christmas shopping spirit. And by Christmas shopping spirit is: everyone grabs a hold of their wallets and write those card details until you sweat because the best deals sell out in minutes. Who could have know shopping could be this stressful? If we have the time, we’ll be writing a few sentences about each model. If they aren’t already available in their full summary in our review section. Remember that many of the larger sites combine these two great shopping das into a weekend-frenzy where new deals are published every hour. Amazon is the largest platform for finding electric scooters right now and therefore you might want to check out their deals hub here. Some companies also offer deals throughout the whole week so you can already find some early deals. Let the bargain hunt begin. The doors to Black Friday has been opened and we are on the hunt for the greatest steals of the year. Even though price drops are an important factor to take into account when buying. It’s not everything. Being too cheap might ruin Christmas for you or someone you love. We don’t want Santa to disappoint someone this year, would we? So make sure you read up on the performance of each electric scooter, better yet our reviews on them, before jumping the rope. Most bang for your buck unit that takes on the heavy-duty work without asking questions. After the weekend passes its time for Cyber Monday, initially created for the online markets where Black Friday was more of a bricks and mortar store promotion day. Things quickly got out of hand and these days most stores smash both together into a crazy weekend of falling prices on everything you love, and that, of course, includes electric scooters. Below we have created a list of all the greatest and best electric scooter deals that our robots and we have found while searching the internet like the Santas little helpers we are. Everything just to make it a ton easier for you to find these deals and take one home before its too late. So even though you should do your research before pulling the plunge. Don’t wait for too long as the most bang for your buck models is quickly sold out. Trust me, I’ve been doing this for e-rides since back in 2015. If you can’t decide, remember that we have a ton of different guides for buying electric rides. Xprit Electric Scooter review - Bargain or trash?